I saw new comparsion tool in VS 2012 for comparing two files or two versions of file. I like it. But when I tried to find it I can't because I don't use TFS. Is there a way how can I just compare two files with builtin feature in VS but without TFS? Inspired by the accepted answer above, I found a very comfortable way how you can instantly compare two files with Visual Studio by using drag and drop or via the "Send To" context menu. It only requires a little preparation which you need to do once and then it is useful like a Swiss army knife. You might notice that I have reversed the %1 and %2 parameters in the batch. This is because I noticed that the file explorer passes the 2nd file as first parameter, then the 1st file as second parameter. Either create a shortcut named "File Compare" for VS_FileCompare.cmd and place it on the desktop (as used in the animation below), so it is always available to drag & drop files onto it or directly place the batch file on the desktop. That's all! Note: It does not harm if Visual Studio is already open. In this case it will just open up a new window within the running instance of Visual Studio. So you can compare multiple file pairs, but please ensure you have selected only 2 files at a time. Here's an alternative how you can use the batch file. It allows to use the context menu's Send To folder to compare the files. Open the SendTo folder by entering shell:sendto into the file explorer's address bar (as described here). Then, put the prepared shortcut into this folder. Right-click to bring up the context menu. Select More > Open File Location. Windows Explorer opens with the Visual Studio shortcut highlighted. In the properties dialog, you can find the path in "Target:"
There is also a Visual Studio extension called CompareFiles, which does nothing else but adding the "Compare Files" entry to the solution explorer context menu. It invokes the built-in Visual Studio diff tool. I had this problem as well. No TFS, but I found this article helpful. Visual Studio code is great for this - open a folder, right click both files and compare. 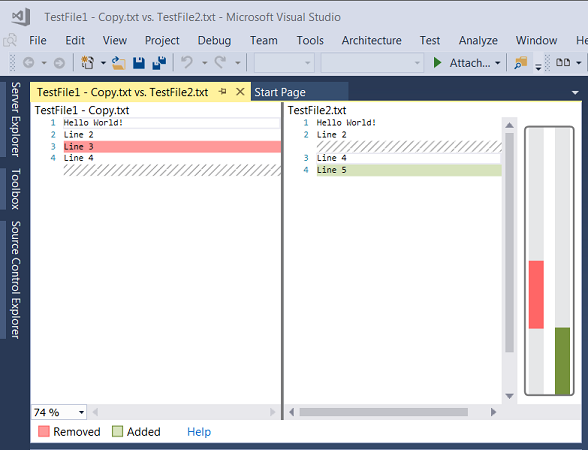 I believe this to be one of the better extension for Visual Studio 2012, it's called Code Compare and can be found here.